Peel and dice the onion. Then chop the garlic and the coriander. We boil the water and once the water is boiling, put in some salt in the water and add in the spaghetti. Stir it occasionally until the pasta is cooked according to packet cooking instructions. While the pasta are cooking, start to sauté the onions. Then add in the garlic. Add and stir in the sardines and the tomato sauce. Let it simmer for around 2 minutes. 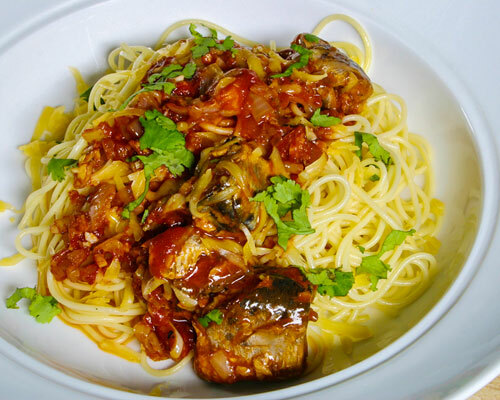 Comments: This Italian delight is a great recipe for those who like seafood with pasta as it is not only delicious and easy to prepare but also serves as a nutrition powerhouse packed with an array of minerals like calcium, copper, selenium, manganese, phosphorus that are associated with healthy heart, healthy immune system etc. This dish made from wholegrain spaghetti is high in dietary fiber that helps reduce blood cholesterol levels and lowers risk of heart disease. This high protein dish will be definitely any athlete’s choice as protein is needed for muscle building, growth & repair.